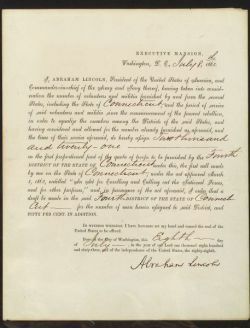 Lincoln, Abraham (1809-1865), Signed Document, July 8th, 1863, one page, as President, a draft call levied on fourth district of Connecticut to provide 2,021 troops to the Union Army, (very good). Note: One of Lincoln's infamous Draft Calls coming the week after the Battle of Gettysburg and the Fall of Vicksburg. 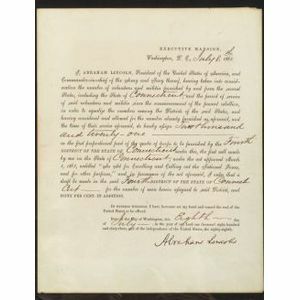 This terse document was the result of the passage of the "Act for Enrolling and Calling out the National Forces" in March of 1863. This draft so enraged the lower classes of the North (as many could not afford to "buy a volunteer"), that it spawned the bloody New York draft riots in which mobs ruled the streets of New York for days, burning houses owned by blacks and lynching several innocents. Union troops eventually quelled the disturbances, killing over 500 rioters in the process.